Today, we have a garage gym DIY “project”! Notice I put project in quotations, because this is hardly a project, and more of a case for why you should have extra PVC and chains in your garage. PVC plays an important role in a garage gym – it can help with mobility, we’ve used it to make a slosh pipe, parallettes, and even rings. PVC is pretty awesome because you are only limited by your imagination, and it’s cheap. Now, this project may be simple (not as simple as the weight storage idea I posted a few years ago), but don’t let the simplicity fool you out of thinking this project doesn’t have utility. A simple combination of chains, spring links and some PVC can pack a powerful punch in building your strength, fitness and grit. Keep in mind the diameter of your PVC will make gripping it harder or easier, but it also needs to be big enough for the chain to pass through. The 1.5″ PVC is pretty thick and challenges my grip on things like the farmer carry, but hey, it’s good for you! Pretty simple. This is more like a grocery trip than a DIY project. The guy at Lowe’s (or Home Depot) will cut the chain for you, just like they will make the cuts for you in the plyometric box project. PVC and spring links are an easy snag and relatively cheap. The best part…? We can get straight to using this stuff! Minimal (if any) craftsmanship involved. I love DIY Projects, but sometimes the glue, screws, cutting and sanding can get in the way of the best part….USING the project. Well, maybe I am getting ahead of myself here…there are two cuts you need to make which should take about 30 seconds. But then you can get right to using it! You want a handle length slightly wider than you palm. I made two handles at 6”. Ok, NOW let’s use it. 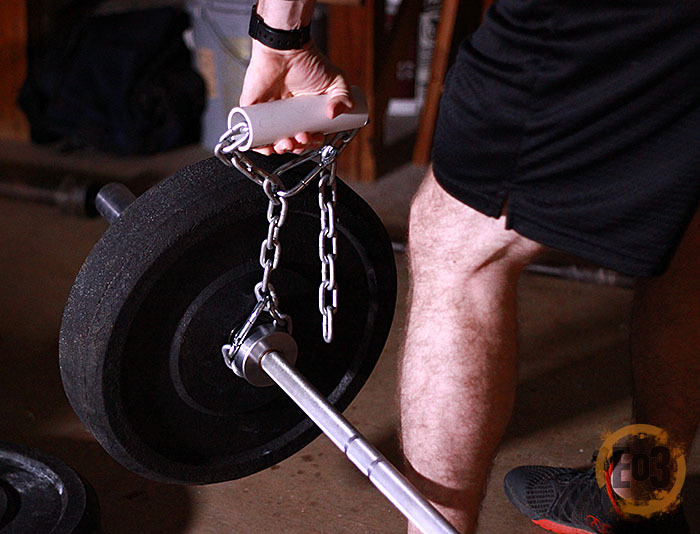 When it comes to chains and PVC, this is no exhaustive list, rather a few ideas to get your going, and I hope you have a weight belt in your garage gym! 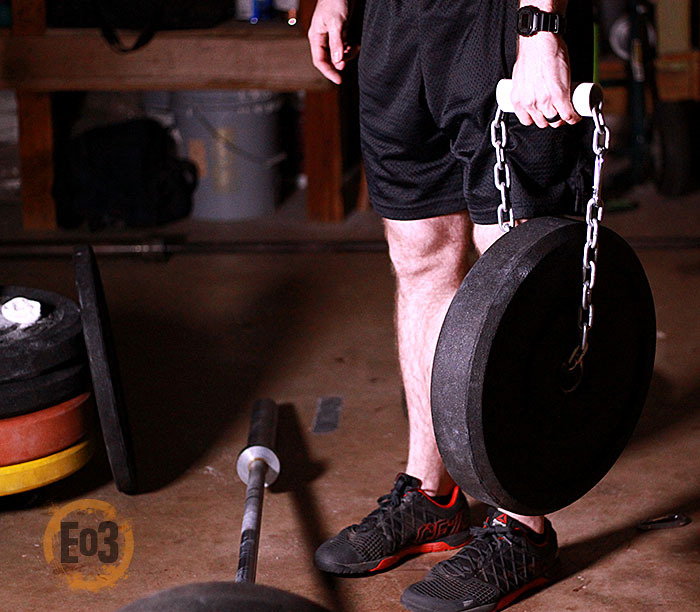 You can use chains (not these small chains) on a barbell for adding accommodating resistance, but those large chains can be pricey. 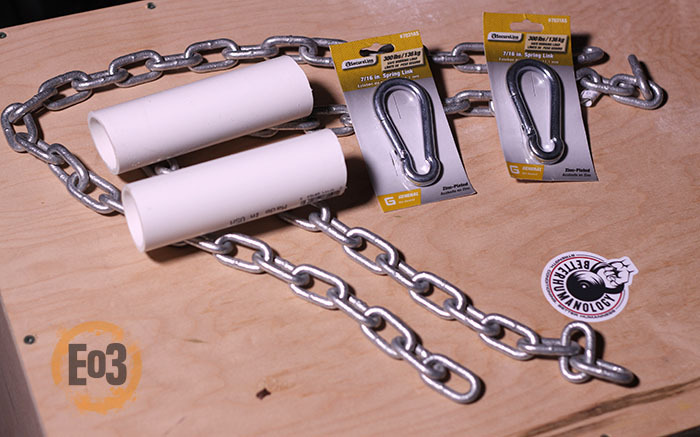 So today’s ideas are simple and things you can do TODAY by simply buying a few feet of chain. Pictured above is the simple weighted pull-up and dip. Weighted pull-ups and dips are great! Weighted bodyweight exercises are great for getting better at them. For instance you don’t have to be able to knock out 20 weighted reps to be doing weighted dips or pull-ups, even if you just do sets of 1-2 at a time, you will be significantly building your grip strength (in pull-ups) and static strength (in dips). Not to mention how much strength will be added to your lats, triceps, shoulders. This is great option to throw into your training. Have you ever tried a hip belt squat? No!? Today is your lucky day! The hip belt squat shouldn’t be viewed as a replacement to big movements like the back squat or deadlift, but it is a great supplemental exercise you can add to your training. Hip belt squats are great if you are working around an injury or if you just simply don’t want to load your spine or lower back with a lot of weight. It’s similar to a hack squat or leg press but you’re forced to use coordination and stabilization in the exercise. It can help with vertical jump, packing on muscle and overall strength. It’s a great exercise! In my picture above I have the boxes higher than you need, but this was just for the image. The boxes only need to be as high as you need to get depth in the squat without the weight resting on the ground. The farmer’s carry may just be one of the most functional movements in existence. I mean, you carry groceries from your car to your house, right? But it goes a lot further than that! The farmer’s carry actually works your grip strength, arms, back and shoulders, core and legs! Your forearms will light up when you do farmer’s carry and your biceps and triceps must work to stabilize the elbow and shoulder joints. The muscles in the back and shoulders are heavily targeted, particularly the traps. These muscles must work together in a continuous contraction to keep your shoulder blades together and down, and to keep your shoulder joints stable. Back and abdomen must work in sync to support your torso and the additional weight. Keeping your abs tight during the exercise is necessary to protect the lower back and prevent any shear stress or vertebral buckling. Lastly, because the farmer’s walk requires you to walk, the quadriceps, hamstrings, gluteus medius, gluteus minimus, and calf muscles are used extensively. A simple single arm land mine setup will help maximize range of motion on your one-arm rows, Meadows rows, Kroc rows, and countless core exercises. 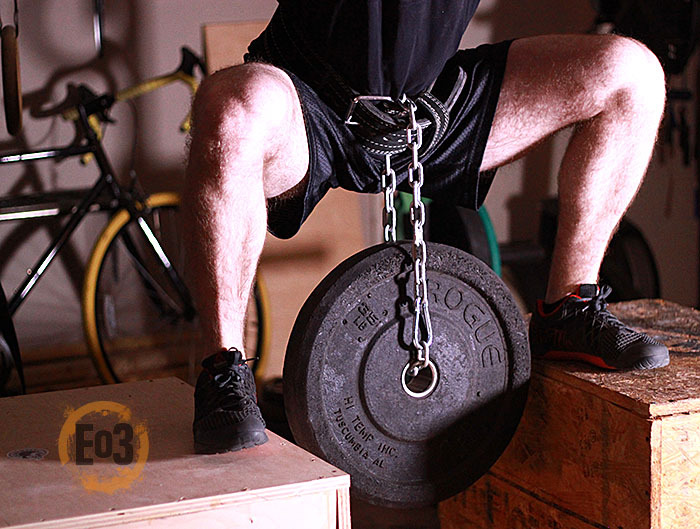 The chain also provides a stability element than if you were just to grab the barbell in the center. Simple setup. Easy execution. Huge results. Well, that’s it! A few simple and quick options for you to spice up your garage gym training! I would love to hear your ideas on what you can do with these items to maximize training in your garage.